In 2015, Loma Linda University Health (LLUH) received nearly 1 million visits to its medical center in Loma Linda, CA, where patients benefit from a faith-based approach to healthcare and wholeness. In its pursuit to support patients as they develop and continue healthy habits, LLUH identified a need for a user friendly, web-based wellness application that could be used by a broad and non-technical audience. The LLUH technical team built an early prototype for a community wellness map using an off-the-shelf Esri Web App Builder (WAB) template. The prototype successfully integrated GIS technology with inputs from the electronic health record (EHR) system. However, the user interface was more technical than anticipated and the desired styling could not be achieved within the constraints of the WAB. LLUH selected GISinc as a one-stop-shop to design and develop an application with the functionality of the prototype and a more user friendly, non-technical interface within the critical timeframe identified. A combination of skilled people and existing infrastructure created a focused engagement, allowing GISinc to leverage the WAB prototype as a “living” requirements document to frame a new user interface and user experience. In an interactive design process, LLUH worked with a professional graphic designer to not only refine the look and feel, but to also identify the primary interactions that would shape the experience users have with the solution. “We have been extremely happy with GISinc’s services. They brought a level of expertise we needed to bring LLUH’s Wellness Map to the next level,” - Nicholas Yu, Project Manager. The resulting application is the Loma Linda Wellness Map, an innovative tool to help chronically ill as well as “walking well” individuals identify nearby community assets to keep them healthy and well. 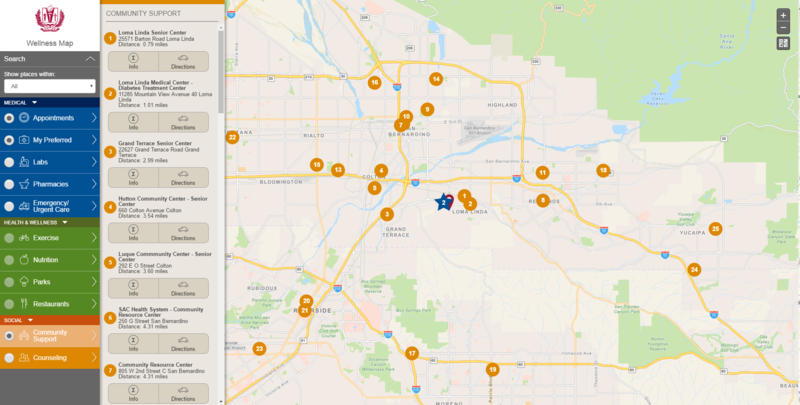 The Wellness Map displays unique and personalized patient views including their home, church, preferred pharmacies, and support groups related to their care. Each patient’s personal Wellness Map is dynamic and will adapt to reflect any preferences and health changes in their EHR. In addition to personalized information, the Wellness Map will also display local farmer's markets, grocery stores, healthy restaurants as well as places for walking, hiking, cycling, swimming, and other types of exercise. Patients can access their Wellness Map via any mobile device or desktop. 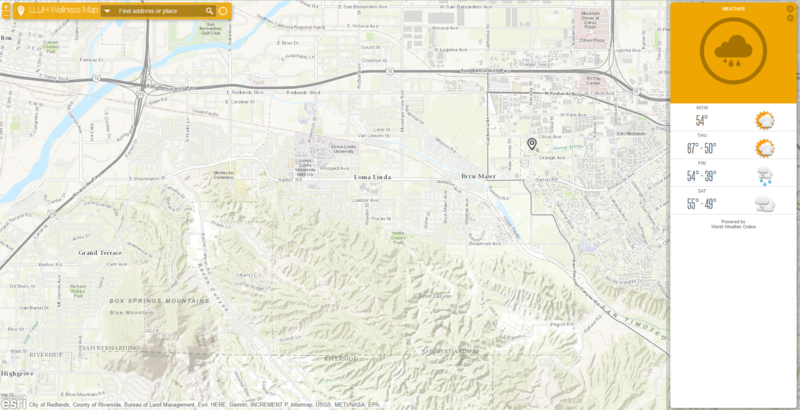 “The Wellness Map provides a spatial view of community and clinical care resources to patients that is personalized and can be easily used at home or on the run, via their smartphones,” - Mark Zirkelbach, CIO, Loma Linda University Health. The Wellness Map will be initially released to select physicians with varying patient populations through the EHR and patient portal. As the solution is proven successful, a broader release of the application will be made available to over 950 faculty physicians. Patient Navigators will also assist with EHR patient portal enrollment, providing education and ongoing follow-up for Wellness Map users. While the goal of the Wellness Map is to increase health in the Loma Linda population, improved health will decrease care costs and stimulate the local economy as patients engage in community resources. Loma Linda University Health understands that managing population health requires new and innovative ways of engaging and encouraging patients to participate in their health and make positive lifestyle changes. The Wellness Map extends beyond the doors of the traditional healthcare system, connecting patients to their community as well as their healthcare team using a mobile, user friendly application.